We’re excited to announce the launch of the SSFX Short-Film Competition. 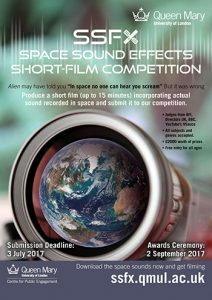 Filmmakers will have the chance to use real-life sound recorded from space in a new competition launched by Queen Mary University of London (QMUL). While the trailer for the movie Alien may have told us: “In space, no one can hear you scream” recordings of sounds from space by satellites seem to suggest otherwise. These unusual noises recorded over eight years have been sped up and amplified so they can be heard by the human ear for the first time. The recordings are free to download for filmmakers to use – and potentially win £2,000 worth of prizes. 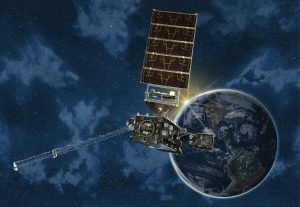 The sounds were recorded by NOAA’s GOES satellites. Competition organiser and space scientist, Dr Martin Archer from QMUL’s School of Physics and Astronomy, said: “From Star Wars to Sunshine, space has inspired and entertained cinema fans for decades. Now we are asking filmmakers to get creative and use an authentic piece of scientific research to realise their vision. Scientists study these sounds to understand their knock on effect on the everyday technology that we rely on as a society, for example mobile phones, GPS systems, TVs and weather forecasts. The competition closes on Monday 03 July 2017. A panel of filmmakers and scientists will judge the competition, and prizes will be awarded at a special one-off screening of the winning films on Saturday 02 September 2017 at Rich Mix in Shoreditch. The SSFX competition is supported by QMUL’s Centre for Public Engagement.